A break from the usual rousing of rabble, for a wee stroll down memory lane. Did you know? U2’s ongoing rehearsals for the iNNOCENCE + eXPERIENCE Tour at the Pacific Coliseum in Vancouver coincide with the 23rd anniversary of the end of the first leg of the band’s groundbreaking ZOO TV tour. 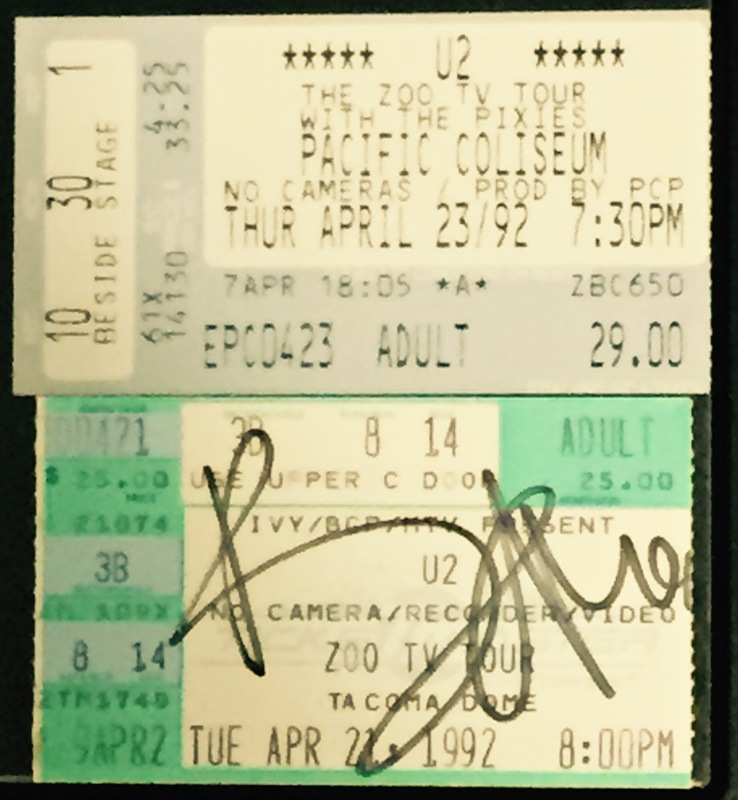 I was fortunate to attend both the April 21, 1992 show in Tacoma, Wash., at the Tacoma Dome and the April 23, 1992 show at the Pacific Coliseum. The Pixies opened both nights. Like 2015, those dates also fell on a Tuesday and Thursday. The band returned to Vancouver for two more shows in November 1992 at B.C. Place Stadium, during the Outside Broadcast tour. Public Enemy and the Sugarcubes were the opening acts; Bjork stood next to me on the floor for a few songs at the start of U2’s set on the second night. A missed opportunity to spark a meaningful conversation, but, hey, it was a tad loud. Back to spring 1992. After I checked into the Tacoma Dome Hotel, I spotted limousines arriving. I made my way to the parking lot and joined a small group to say hello to Bono, who was decked out in his Fly shades on the cloudy day. That explains my autographed ticket stub. The shows were a multimedia revelation, with East German Trabants suspended above a stage spangled with TV screens of various sizes that flashed words and images to create a sensory overload. The band started with eight songs from Achtung Baby, the 1991 Brian Eno and Daniel Lanois-produced fusion of Arabic rhythms and industrial guitar riffs. A little bit of Allah, a little bit of Bowie in Berlin. The show also included a satellite B stage, to enable closer contact with fans for an acoustic set. ZOO TV was Eno’s conceptual baby, a glimpse into the media rich, instant communication, instant gratification future we now call home, where we can make our own album or broadcast live to anywhere from the phone in our pockets. It was an album and tour amid an era of massive change. The Berlin Wall fell and the Iron Curtain parted. Americans went to war in the Gulf. South Africa began to dismantle apartheid. The Internet and mobile telecommunications were about to explode. Peace was on its way to Northern Ireland. Fast forward to present day and U2 — older and wiser, but a tad bruised — is aiming to remake itself again. In a gutsy move, Songs of Innocence was given away to Apple iTunes customers — all 500 million of them — in a Sept. 9, 2014 surprise. A wonderful gift of free music. For some reason, many didn’t agree. The album failed to spawn hit singles. Then Bono suffered serious injuries in a Central Park bicycle crash. He summed up 2014 in a New Year’s Day letter to fans on U2.com. The rehearsals at the home of the Western Hockey League’s Vancouver Giants are under tight security and secrecy. The glass doors at the main south entrance of the arena are obscured by interior black curtains and part of the north parking lot is closed. Initially, the Pacific National Exhibition wouldn’t even confirm the tenant was U2. The sounds emanating from the afternoon and evening sessions are unmistakably U2. On April 21, I happened by during multiple takes of “Raised By Wolves” (click here to hear one of those takes). The song was inspired by the deadliest incident of The Troubles, when 34 innocents were killed by car bombs planted by terrorists in Dublin and Monaghan on May 17, 1974. A dark, tragic day in one of the world’s best places. There are no signs or additional fences at the Coliseum’s south doors, but the arena’s security guards are under strict orders to not allow pedestrians to loiter outside, despite the area being part of the public-owned Hastings Park. I checked with PNE spokeswoman Laura Ballance, who told me the band has also rented the exterior plaza of the building and is reasonably concerned about the possibility of someone recording and publishing a bootleg of an entire rehearsal. I also happened by on April 23 around 7:20 p.m., when I heard “Raised By Wolves” followed by “Until the End of the World.” I closed my eyes and imagined being inside, just like on April 23, 1992. The tour opens May 14 in downtown’s Rogers Arena. And, one more thing. There might just be new, made-in-Vancouver material forthcoming from U2. A source tells me the band was recording in a studio last weekend, but it was not a conventional studio. More to come.